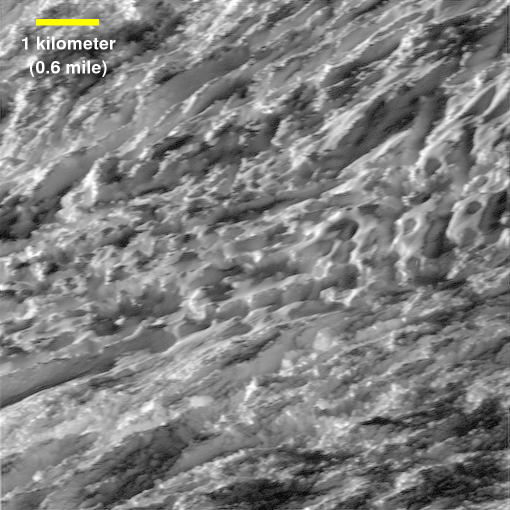 During its closest ever dive past the active south polar region of Saturn's moon Enceladus, NASA's Cassini spacecraft quickly shuttered its imaging cameras to capture glimpses of the fast moving terrain below. This view has been processed to remove slight smearing present in the original, unprocessed image that was caused by the spacecraft's fast motion. A labeled version of this image includes a scale bar. This view is centered on terrain at 57 degrees south latitude, 324 degrees west longitude. The image was taken in visible light with the Cassini spacecraft wide-angle camera on Oct. 28, 2015. 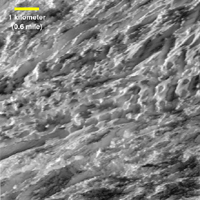 The view was acquired at a distance of approximately 77 miles (124 kilometers) from Enceladus. Image scale is 49 feet (15 meters) per pixel. Photojournal Note: This image was updated on Nov. 4, 2015, to correct the scale bar provided with the labeled version.